Who are candidates for Visian ICL? If you are over 21 and nearsighted, you are an excellent candidate for Visian ICL. It is preferable that you have had no previous ophthalmic surgery or history of ophthalmic disease such as glaucoma, iritis, or diabetic retinopathy. Exactly where is Visian ICL placed in the eye? Visian ICL is placed in the "posterior chamber," behind the iris and in front of the eye's crystalline lens. The lens does not touch any internal eye structures and stays in position. 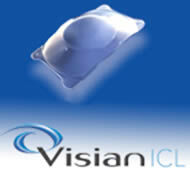 Extensive research and development preceded the introduction of Visian ICL. It is now being used by more than 65,000 patients worldwide. The satisfaction rate among patients is extremely high - above 99%. Visian ICL provides excellent and stable outcomes. What if your vision changes? Visian ICL offers treatment flexibility. If your vision changes dramatically, the lens can be removed and replaced, or another procedure can be performed at any time. With Visian ICL, you can wear glasses or contact lenses if necessary. No. Visian ICL avoids problems experienced with traditional contact lenses. It is designed to remain in place inside your eye, without maintenance. A routine, annual visit with you eye doctor is recommended to make sure everything is fine. Can Visian ICL be seen by the naked eye? No. The lens is positioned behind the iris where it is invisible to both you and observers. You enjoy a cosmetic appearance that is natural. Only your doctor will be able to tell that vision correction has taken place. No. Most patients state that they are very comfortable throughout the procedure. Dr. Brems will use a topical anesthetic drop prior to the procedure and usually administers a light sedative as well. No. You will not feel anything different. The Visian ICL is designed to be completely unobtrusive after it is put in place. It stays in position by itself and does not interact with any of the eye's structures.